Ever dreamed of really, really getting away from it all? There’s a chance to do just that with our expedition along the river Spey. This trip runs for five days and travels from Loch Insh to Spey Bay in the Scottish highlands. Each night, you will camp out, under the stars, on the river bank, next to the warm glow of the fire. Read on to learn more about this amazing trip. This amazing trip begins in the beautiful Loch Insh. This stunning Highland loch, seven miles south of Aviemore. From here the river Spey flows another 60 miles (97km) to the Moray Firth at Spey Bay. We travel this route over five days, the paddling is largely relaxed and our expert guides will be on hand to help you through any sections of fast water. Most of all though, this is a fantastic opportunity to travel some of Scotland’s most beautiful countryside. Each night on the trip you will camp out along the riverside. Sleep under the stars, next to the crackle of the fire and the rush of the river. What better way to truly get away from it all? After a night sleeping under the stars you will wake, not to the ring of an alarm clock or the bustle of the daily commute but to the sounds and sights of the remote Scottish Highlands. If you are looking to escape the city, to break from the grind of daily work life then there is nothing better than spending time in nature. As you paddle down the Spey, you are in with a chance of spotting some of the UK’s most incredible wildlife. If you are very lucky, then you might see an Osprey. These beautiful black and white birds are incredible fish-hunters, plunging talon first into the cold waters. They winter in West Africa and can cover up to 5,000 miles in their migration. In addition to the beautiful Ospreys, the river Spey is home to Atlantic Salmon, Eurasian Otters, and Grey Seals. There is even the chance to spot Bottlenose Dolphins in Spey Bay. Find out more about the wildlife that you might spot on the river Spey in our blog here. While some paddling experience is desired, it is not essential. Our expert canoeists will give some basic paddling tuition before you begin your journey, giving you a chance to get to grips with the techniques and principals of canoeing. All safety equipment will be provided, but feel free to bring your own buoyancy aid, should you have one. 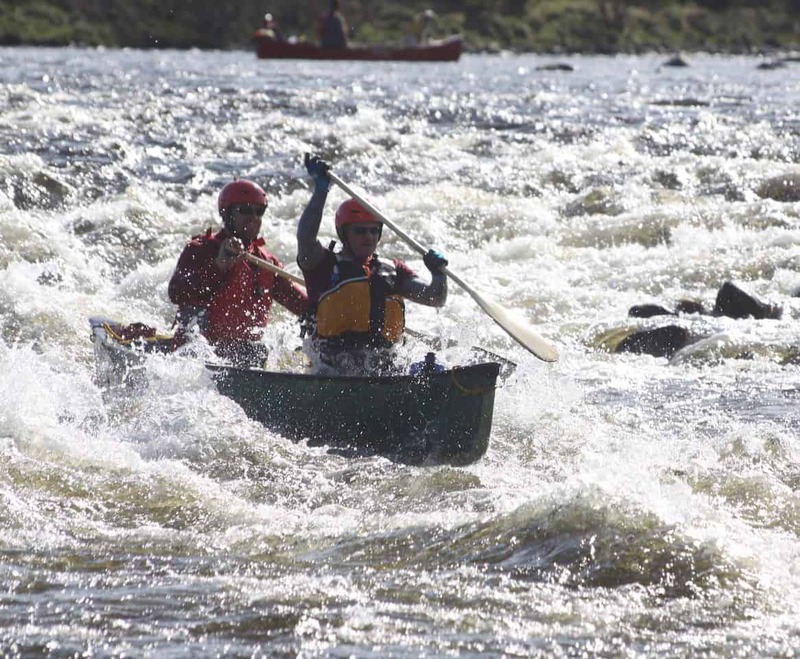 On July 8th -14th we will be undertaking the trip of a lifetime, our canoeing expedition on the river Spey. Starting in Loch Insh and finishing in the magnificent Spey Bay this canoeing expedition takes in some of Scotland’s most spectacular scenery. Read on to learn more about the wildlife that you might see on the way, what the trip will involve, what experience you need, and what you can expect on this incredible trip. The river Spey is home to some of the most amazing wildlife that the UK has to offer. From Ospreys to Red Deer, Otters to Kingfishers, the river Spey has it all. 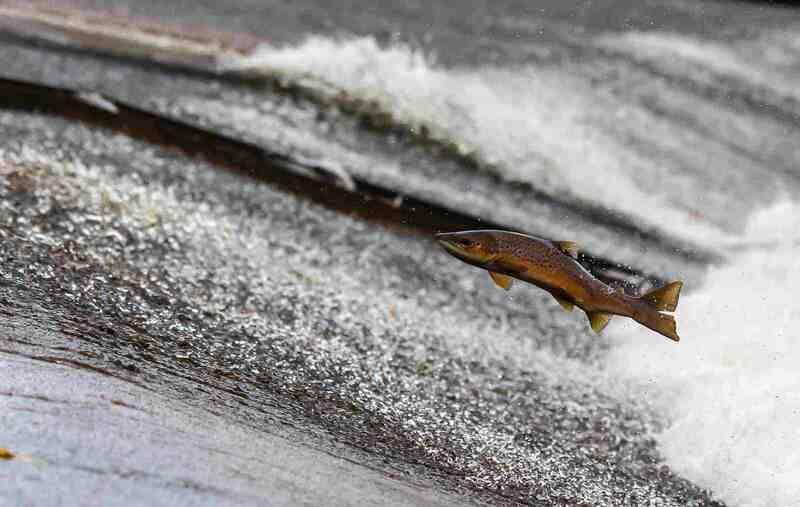 While we can’t guarantee that you will observe some of Scotland’s most beautiful wild creatures, you might be lucky enough to see Atlantic Salmon. These remarkable fish are born in remote Highland tributaries and then make their way downstream. They spend up to four years searching for food in the cold waters around Greenland before returning home. Unlike their Pacific counterparts, Atlantic Salmon don’t die after breeding, meaning that one fish may migrate several times. 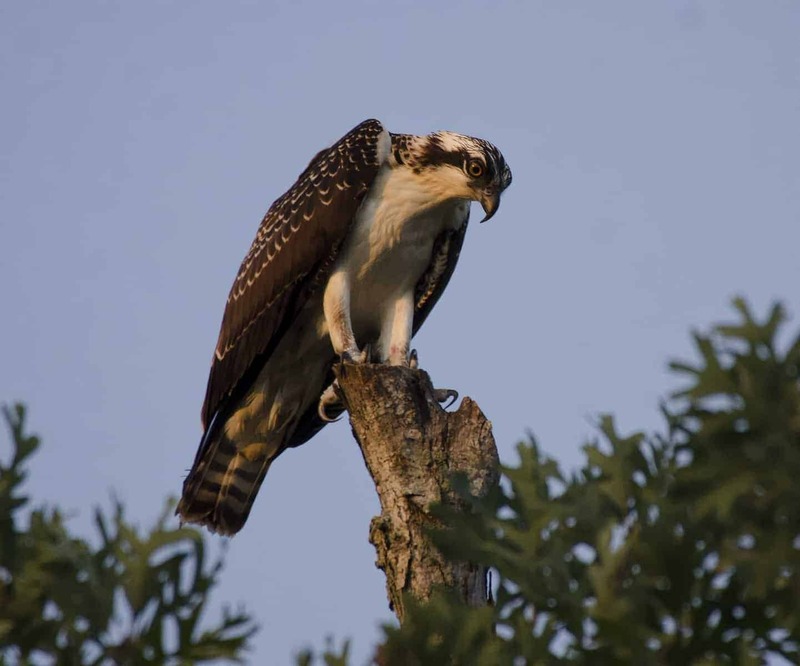 The magnificent Osprey can reach up to a meter and a half (150 cms) in wingspan and hunt by diving talon first towards the water and snatching their prey from the river’s icy surface. A truly spectacular bird the Osprey is on the RSPB’s Red List, holding an Amber status which means that the species is under threat in the UK. Seals are frequently seen in Spey Bay. The Grey Seals, which are the UK’s largest carnivores are happy in both salt and brackish water and weigh up to a whopping 310 kgs. 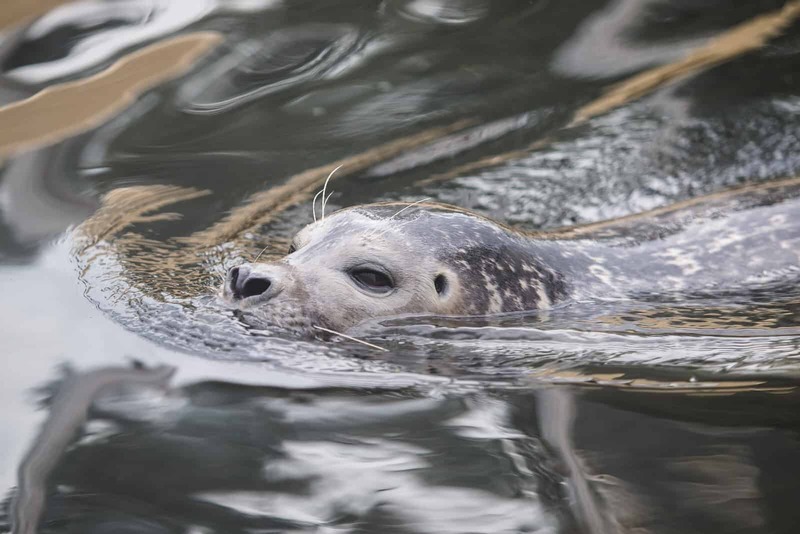 Seals are typically friendly and are known to pop up for a chat with passing canoeists. If you are really lucky, when we get to Spey bay you might see a Bottlenose Dolphin. These elusive creatures are attracted to the area by the large population of Atlantic Salmon. Friendly by nature, those living in and around Spey bay are known for showing off their acrobatic skills. Sign up for more information on our 2019 trip! While some canoeing experience would be an advantage it is not a requirement. Our expert paddlers will be on hand to provide tuition at the start of the trip and help you out as we travel along the beautiful river Spey. The trip is open to everyone aged 15 years and over, but under 18s must be accompanied by an adult. You will need to be reasonably fit and all participants must be able to swim. Our river Spey expedition is a truly unique and memorable event. Starting in Loch Insh we will canoe along the river Spey until, six days later, we reach Spey Bay. Each night we will be wild camping alongside the river, sleeping out under the stars and listening to the sounds of the flowing water. If you are looking for peace, escape and adventure then this is the trip for you. 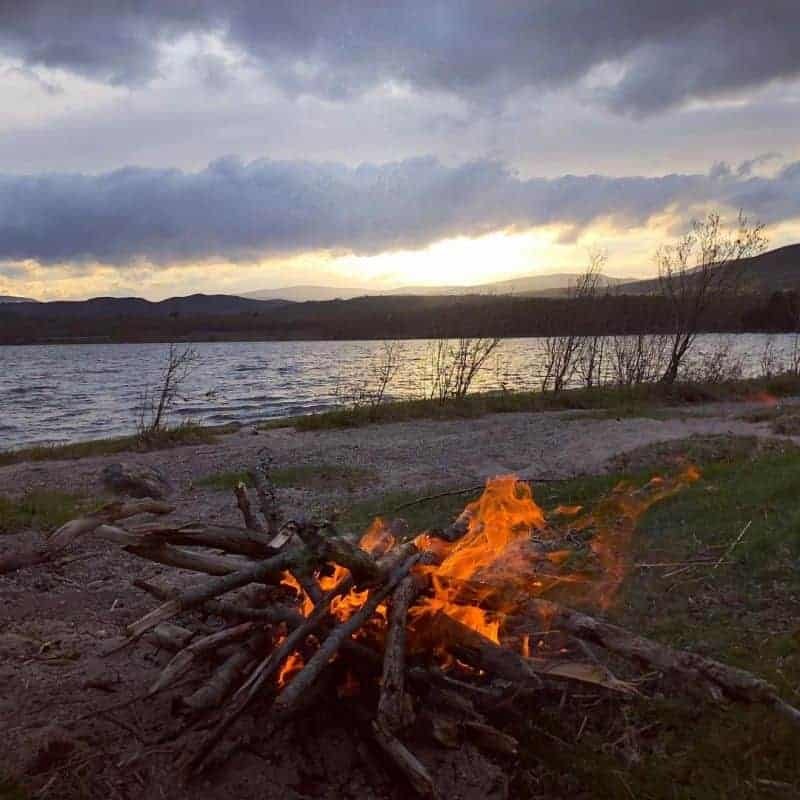 Each night there will also be the chance to take part in some land-based bushcraft, though this part of the trip is purely voluntary and you are welcome just to relax by the river if you would prefer to do so. Being able to light a fire by friction, using a bow drill is often seen as one of the key bushcraft skills. In this blog, we’re going to show you how to choose the correct wood for a bow drill and have a quick look at which types work best together. Remember, the best way to learn how to light a fire by friction is to sign up to a bushcraft course with an experienced instructor. Click the following links to find out more about our friction fire lighting and weekend bushcraft courses. A bow drill is composed of four main parts – the bearing block, the drill, the hearth, and the bow. At it’s most simplistic, a bow drill works by grinding two combustible materials which are rubbed together until the material is taken beyond its auto-ignition temperature, this then creates an ember which is used to ignite timber. To find out more about how bow drills work and the anatomy of them read our blog Bow Drills a Beginners Guide. 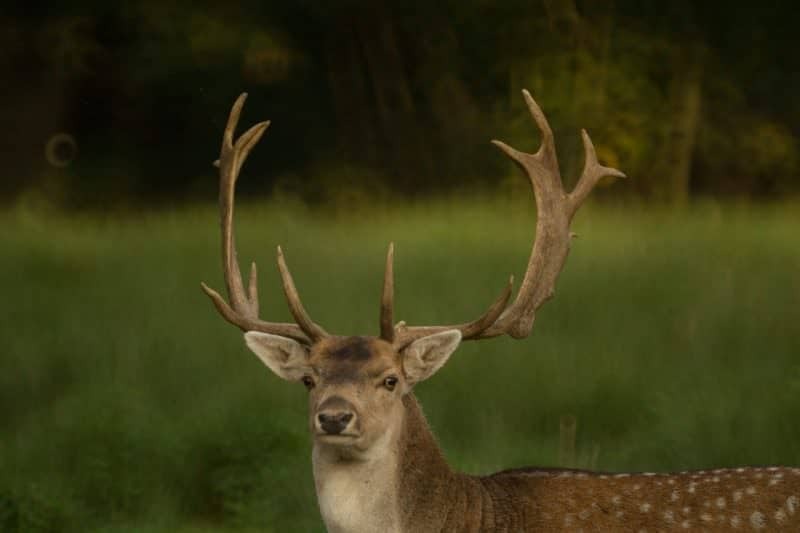 What follows is not an exhaustive list of woods that are suitable but rather a selection of those that we consider some of the best suited to making a bow drill in the UK. Remember, never take live wood. Look for dead wood that has not yet started to decay. Bushcraft is about living in harmony with nature, not overcoming up. 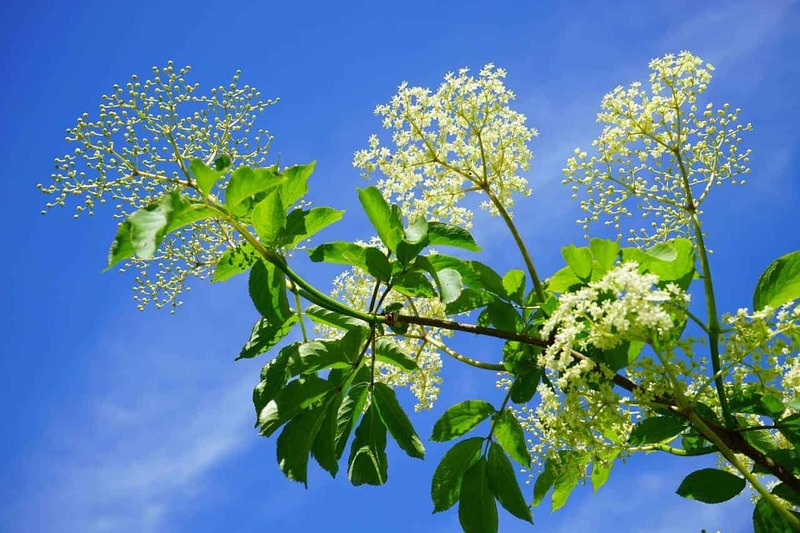 Elder is native to the UK and is thought to be named after the Anglo-saxon ‘Aeld’ which means fire. This is because its hollow stems were thought to be used to blow air into embers. Willow (Salix or Salices) is a very varied genus. 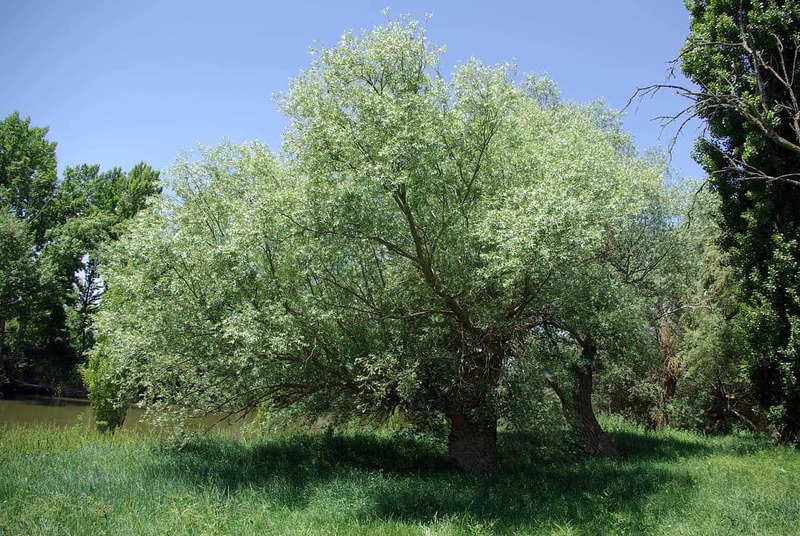 The Salix Fragilis crack willow is one of Britain’s largest native willows and grows to around 25 metres. Hazel is a tree that is native to the UK. Not only is it native, but it is also one of the most useful trees for bushcraft. 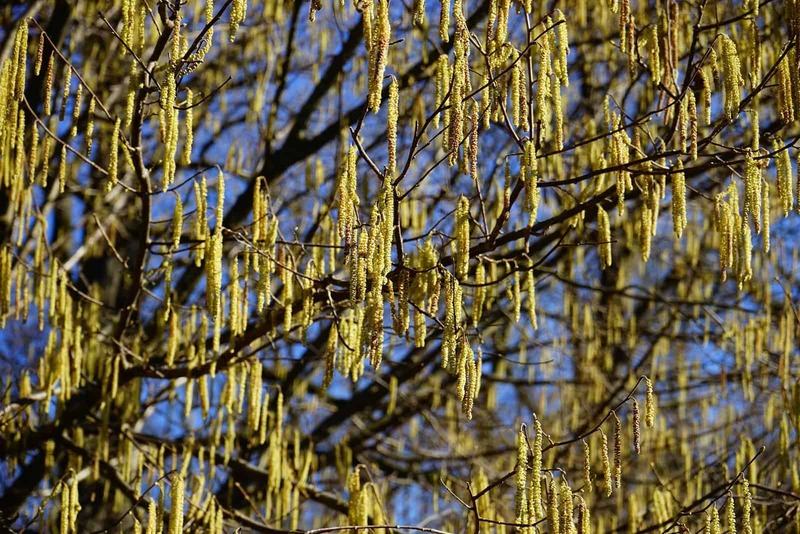 Throughout the ages, Hazel has been thought to protect against witchcraft, protect against evil spirits, in ancient Ireland it was considered to be the tree of knowledge. 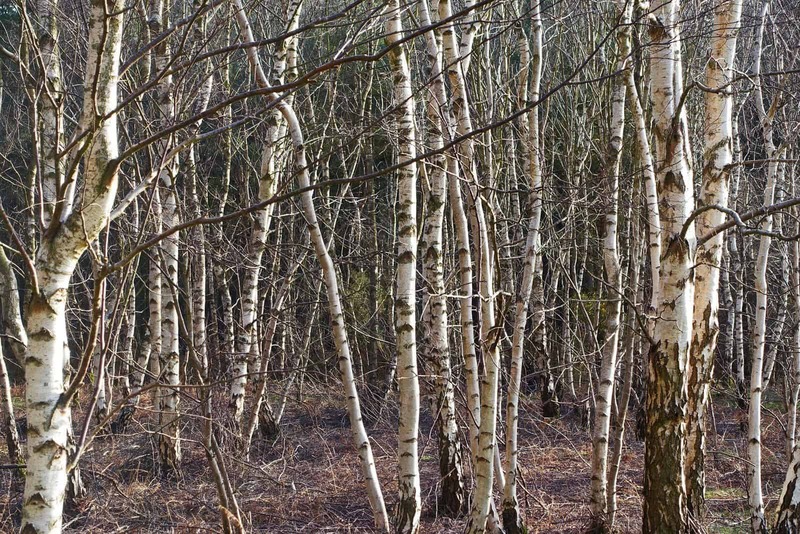 Silver Birch is incredibly useful for bushcraft. It is also heavily bound up with Celtic mythology. In the past, it symbolized renewal and purification, love and fertility. Silver Birch is also great for fire lighting using sparks. This is the first in a series of guest blogs. The author of this first guest blog is from Billy at Perkin Knives (https://perkinknives.com), custom knife makers based in the UK. Read on to see what Perkins Knives has to say. We all love to be outdoors! But being outdoor enthusiasts or adventure lovers, we need to develop a certain set of skills. Of all the varied skills that the outdoor enthusiast needs, knowing how to make the best use of a knife is possibly one of the most important. A knife is an irreplaceable part of your outdoor kit, and knowing how to use it makes your time in the outdoors much easier and enjoyable. Knowing how to use a knife for bushcraft and camping though first relies on having chosen the right type of camping/bushcraft knife. Perkin Knives are one of the best custom knife makers in all of UK. They sell a wide range of premium quality knives from Bowie to hunting to camping to bushcraft to a hatchet to axes and even choppers. Knowing how to start a fire is totally crucial in every sense of the word. You need to use your knife to ignite a Ferro rod as it’s one of the most convenient ways to start a fire. Ferro rods can be used thousands of times, so you don’t want to skip this part of learning. You should practice with both dry and wet materials, maybe at your own backyard, before trying to use this skill for real. This skill can be best honed at home, before you set out camping. You just need to have a firm grip on the knife at all times. You can chop up branches and wooden sticks to collect all the firewood you need to start a fire. This is one of the most important knife skills to learn. By knowing this, you can light up a fire even when it’s damp, or all when other methods have failed. This skill is not rocket science, but it’s not a piece of cake either! Practice makes perfect, right? Carving helps you to construct super useful tools like spoons, bowl. etc., when you are out in the wild. This process is both fun and also helps to make use of whatever’s lying around you. So, basically you could carve anything and everything starting from weapons to utensils to baskets, cooking tripods etc. You could use a knife to prepare your food when you are out camping. From preparing vegetables to small game butchery, a knife is an essential tool for wilderness food preparation. These are just a few of the basic knife skills that you will need for bushcraft and camping adventures. Remember, practice makes perfect and it all starts with choosing the right tool for the job. 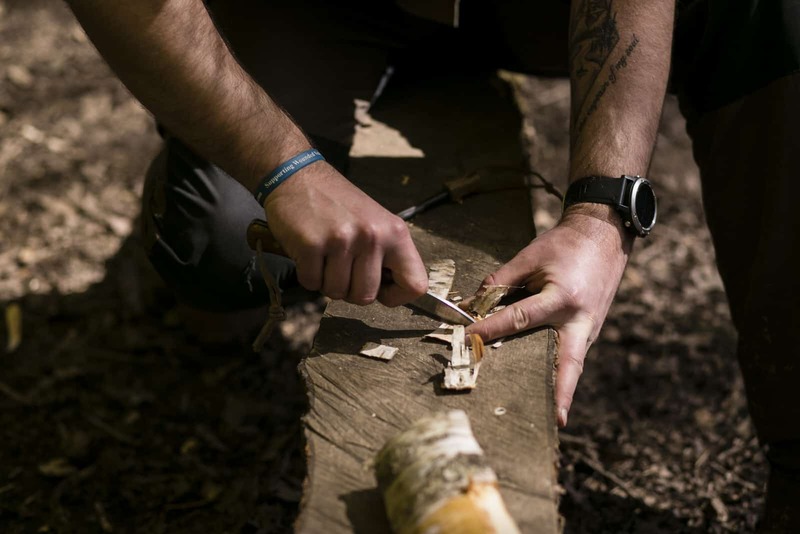 The best way to perfect your knife skills is to join our weekend bushcraft course. Spring is well and truly here, despite the recent weather in certain parts of the country. 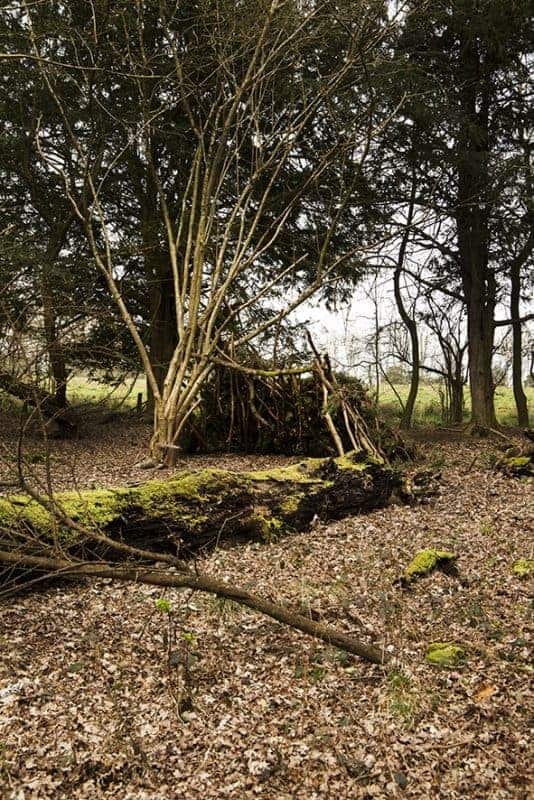 With it, spring brings the chance for the keen outdoors and bushcraft enthusiast to find some of the edible plants that we have here in the UK. Read on to learn more about some of the edible plants that we have in this country and there uses. have not positively identified as edible. 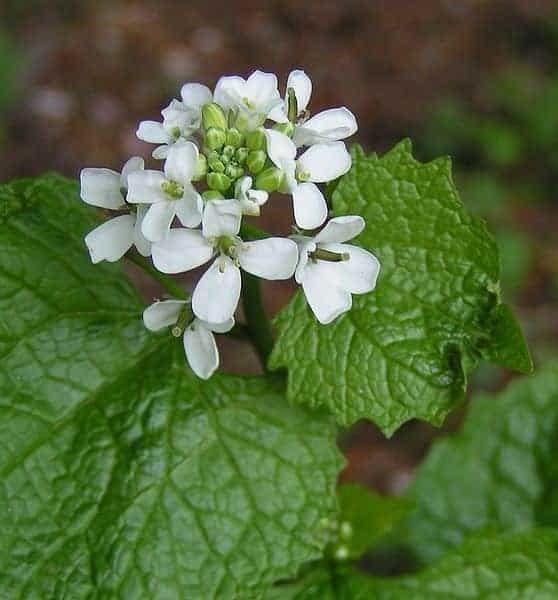 Garlic Mustard is also known as ‘hedge garlic’ or ‘jack-by-the-hedge’. Its Latin names are Alliaria petiolata (M. Bieb.) Cavara & Grande (A. officinalis, Erysimum alliaria, Sisymbrium alliaria). The plant is most commonly found in damp shaded areas, such as at the edge of woodlands or in hedges. Typically, it doesn’t spread onto arable land. It flowers from April through to May with seeds being shed in July. The plant is edible and is most commonly used as a salad green and has an odor of garlic, a characteristic which is helpful in identifying it. 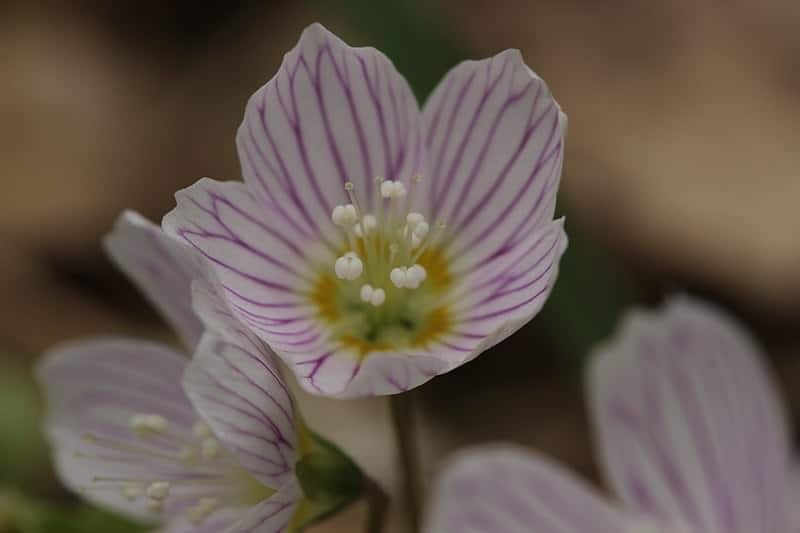 Wood Sorrel, or to give the plant it’s proper Latin name Oxalis acetosella grows in woodland, hedgerows and river banks throughout the British Isles. It typically flowers from April through to May although, depending upon the weather it may flower for a second time in the summer. Although the plant is edible it should only be eaten in small quantities as it does contain oxalic acid which is thought to cause kidney damage. It is recommended that children don’t eat Wood Sorrel at all. Wild strawberries are very different, and in our opinion more delicious, than their shop bought counterparts. 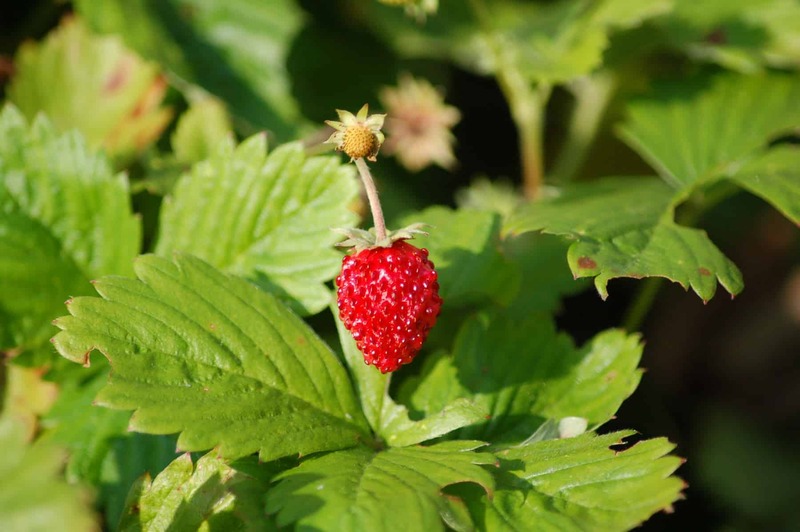 Their official Latin name is Fragaria vesca and they produce tiny, edible red fruits. Wild strawberries in the UK are most typically found in open woodland and scrubland. They particularly thrive in limestone and chalk downland soils. They are most likely to be spotted from April through to August, it can easily be identified by its tiny heart-shaped red fruits growing on the outside of the plant. Pignuts, properly called Conopodium majus is a small plant with edible underground tubers. It is best to forage Pignuts in the spring as once the leaves and flowering heads die back they leave no above ground presence. They are most commonly found in open woodlands, hedgerows and dry grasslands. 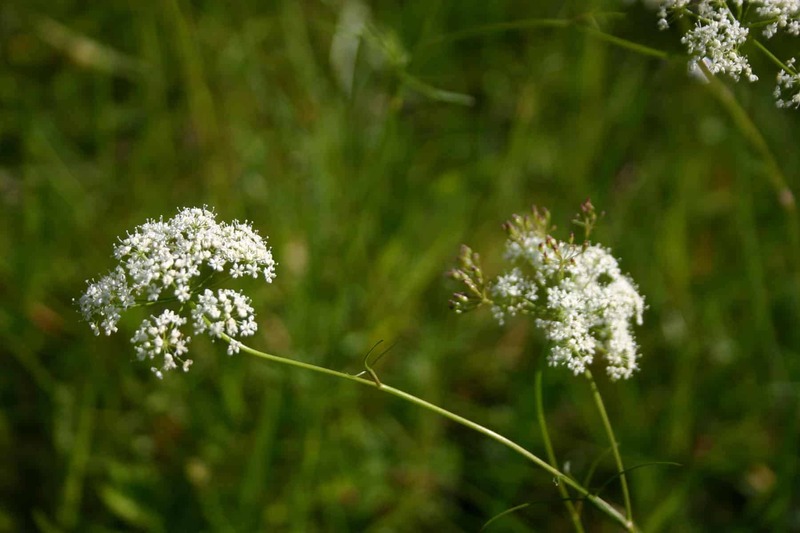 They are a member of the carrot family and have fine and delicate flowers on delicate branched stems when pignuts flower they have small white flowers. The tubers are edible and are not bad tasting. They are eaten by digging down under the plant and extracting the tuber – typically found about 20 cm under the ground. The much-maligned stinging nettle is actually an incredibly versatile plant in the hands of the experienced bushcraft enthusiast. Found in gardens, hedgerows, woodlands and very many other places the common stinging nettle can be found throughout the UK all year round. 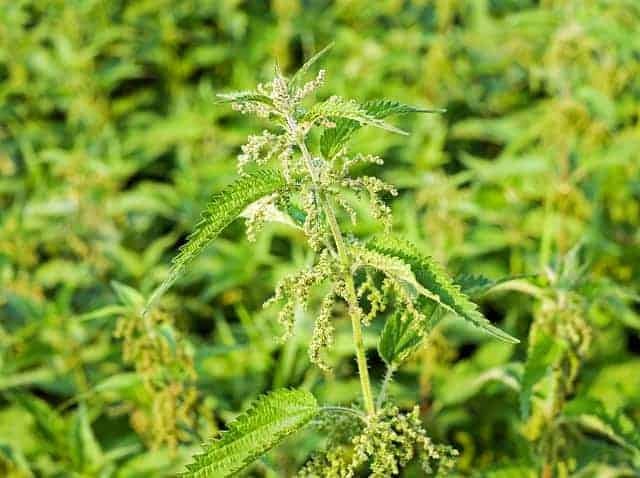 Also known by its Latin name of Urtica dioica the leaves of the nettle are edible and are best picked throughout spring. For the best tasting experience, pick them when it has dried off after a recent rain shower. The stinging part is neutralized by boiling or blanching it. After this, the leave can be used as you would do a leafy vegetable such as spinach. Nettles have very many other uses for the keen bushcraft person. The stems can be used for cordage and the leaves can be used for making tea. 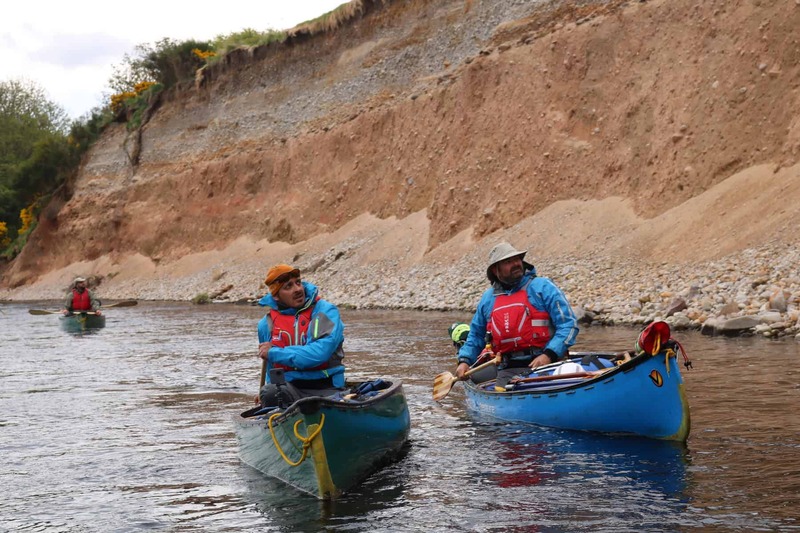 On the 8th-14th of July, 2019, we will be running our annual canoeing expedition along the river Spey. With only four months to go until this amazing trip, we thought that we would have a look ahead at what you can expect on this incredible expedition. The river Spey is one of the most incredible rivers in Scotland. It runs from Loch Spey in the Scottish Highlands through to Moray Firth at Spey Bay. It is the third longest and fastest-flowing river in Scotland and the ninth largest river in Scotland. On our river Spey expedition, we will be traveling from Loch Insh all the way down to Spey Bay. It will run for five incredible bays which will transport you through some of Scotland’s wildest scenery. The river is home to some amazing wildlife, including Atlantic Salmon, otters, seals, deer and Bottlenose Dolphins have even been spotted in Spey Bay. Who knows what you might be lucky enough to see. If you would like to learn more about the wildlife on the river Spey then read our blog here. As we travel down the Spey we will be wild camping along the river each night. Setting up under the stars we will have a campfire and a chance to sit around an enjoy the remote scenery. If you would like to learn some bushcraft skills we will be running small demonstrations each evening, but these are not compulsory. Hazel helping out with some last minute canoeing prep. 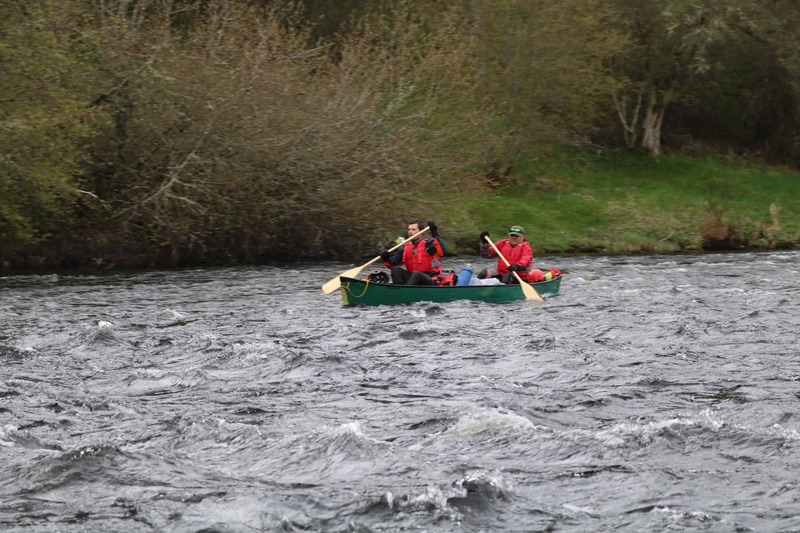 While some paddling experience is obviously an advantage no experience is required for joining our river Spey canoeing trip. 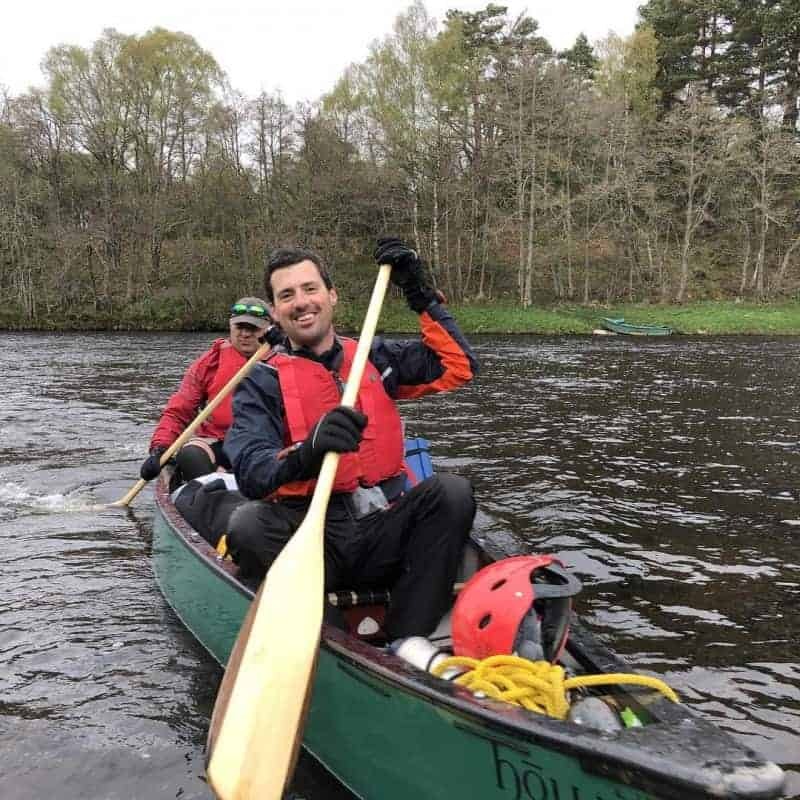 The expert paddlers at Wildway Bushcraft will provide you with tuition and there will be a chance to practice a bit of paddling before getting on the Spey. We do provide you with dry bags to keep your kit safe, but it is best to pack lightly as space in the boats is limited. 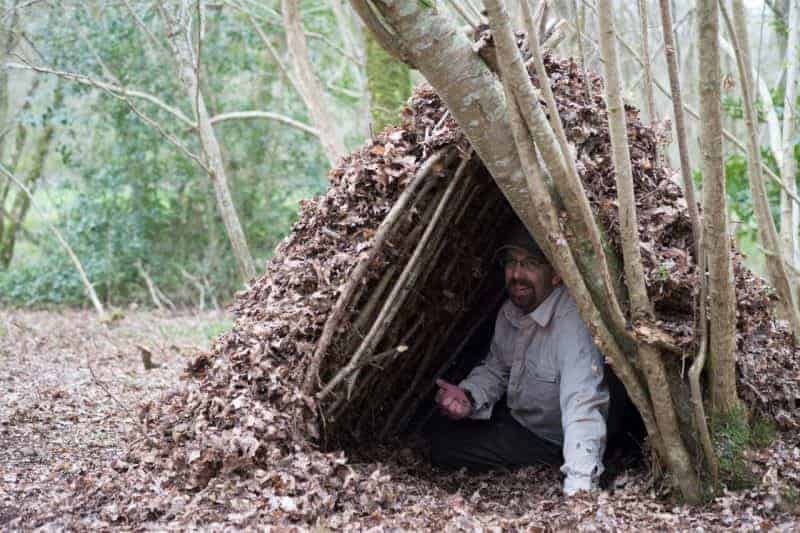 If you have any questions about what you need to bring then don’t hesitate to contact us on john@wildwaybushcraft.co.uk . You do need to be over 15 in order to come on this trip and all under 18s need to be accompanied by an adult. Our river Spey trip is truly a once in a lifetime trip. Imagine, five days in the beautiful Scottish Highlands, slowly making your way down the river and camping out under the stars every evening. Watch our video below to see what you can expect on our amazing canoeing expedition. In this blog, we’re going to be looking at knife skills for bushcraft. In particular, we will be looking at how to use a knife to make feather sticks. Feather sticks are a great fire lighting tool and can help you to get a fire started in damp or even wet conditions. 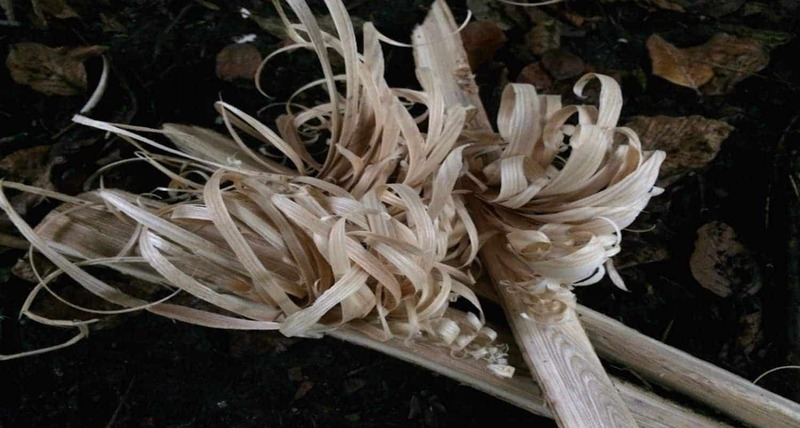 Read on to learn more about the bushcraft knife skills needed to create feather sticks. A knife is often seen as a key part of a bushcraft enthusiast’s kit. 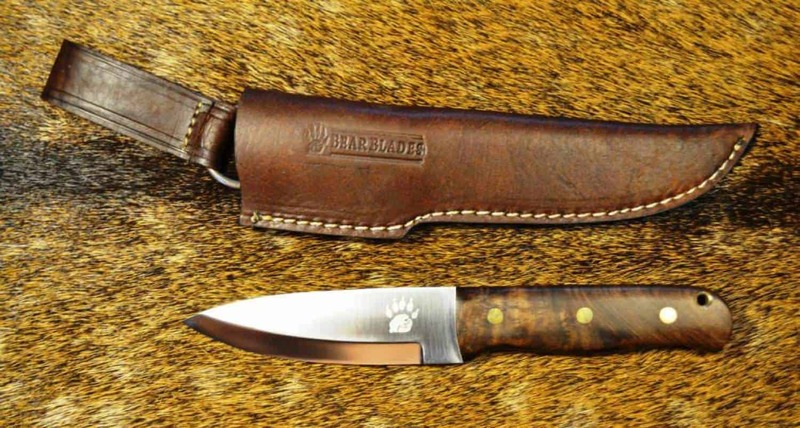 Topics on ‘which’ knives are popular on many bushcraft internet forums, and knives are often fetishized among certain groups of bushcraft enthusiasts. We believe though that a knife is a tool and, like any tool, a knife is made to be used – not locked away and only ever taken out to look at. Also, like any tool, you need the skills to use it. Read on to learn more about knife skills for bushcraft and how to make feather sticks. Find out more about how to sharpen your bushcraft knife here. Learn about knife safety for children here. When it comes to knife skills for bushcraft, feather sticks, like almost everything else, doesn’t start with the knife, it starts with choosing your materials. Whatever you are doing in bushcraft, you should be looking to be using standing, deadwood. 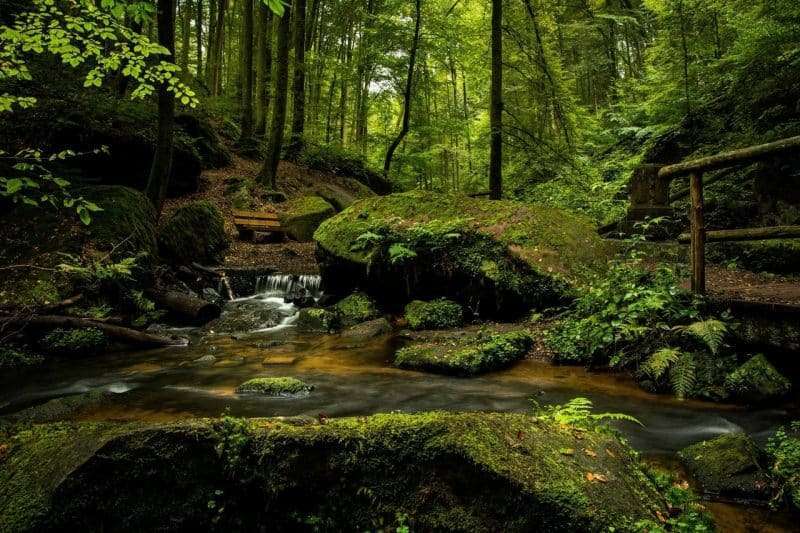 Bushcraft is about being in harmony with nature, not overcoming it. The wood that you should be looking for when it comes to feather sticks should be standing dead wood. The wood should be around the thickness of your arm and about the length of your extended middle finger to your elbow. The first bushcraft knife skill that you will need for making feather sticks is battoning. Battoning is splitting wood by placing your knife on top of the wood and then, making sure that about an inch or so of the tip of the blade protrudes over the edge of the wood. Gentle tap the blade, being sure to hit it along the centre, into the wood. Keep bashing the knife into the wood until it splits, then repeat the process until you have split the piece of wood that you have chosen into four. The next knife skill that you will need involves making the curls that form the feather sticks. To learn how to do this, watch the video below. On our weekend bushcraft course we will introduce you to some basic knife skills. We will show you several knife techniques that you need for basic bushcraft skills and how best to put these into practice. 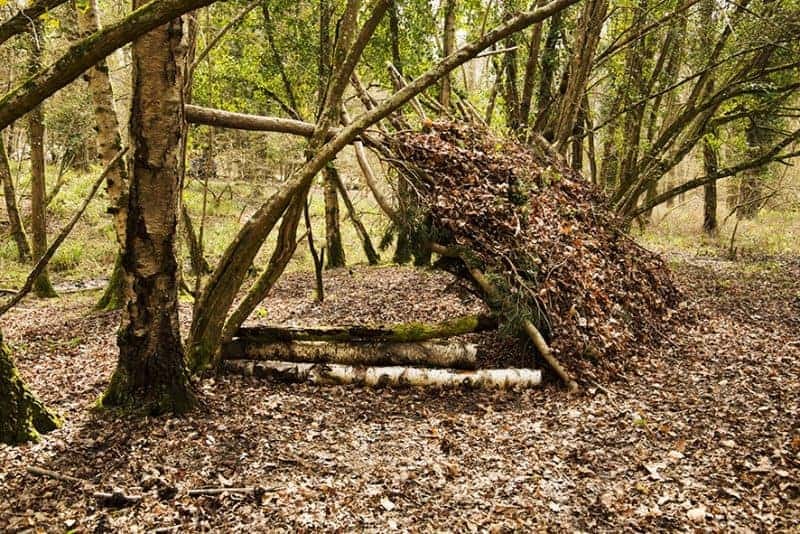 Our Intermediate Bushcraft Course will introduce you to more advanced techniques in a way that enables you to live out in the woods for a week. The ability to light a fire by friction is one of the fundamental skills of bushcraft. It is a skill which our ancestors perfected over millennia, before, sadly, losing these skills in the face of industrialization. Mastering this skill though can give you a huge degree of freedom. 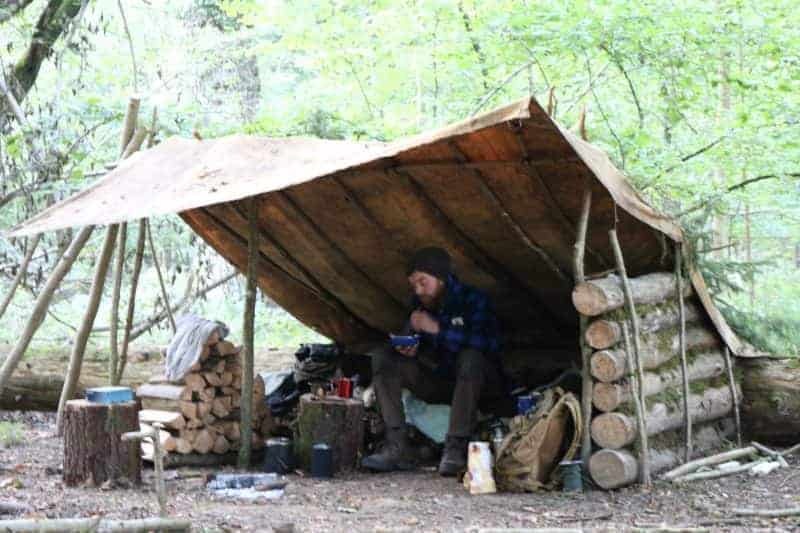 Once you are truly comfortable with bushcraft, you will be able to go into the woods with nothing other than what you are wearing, and live comfortably. 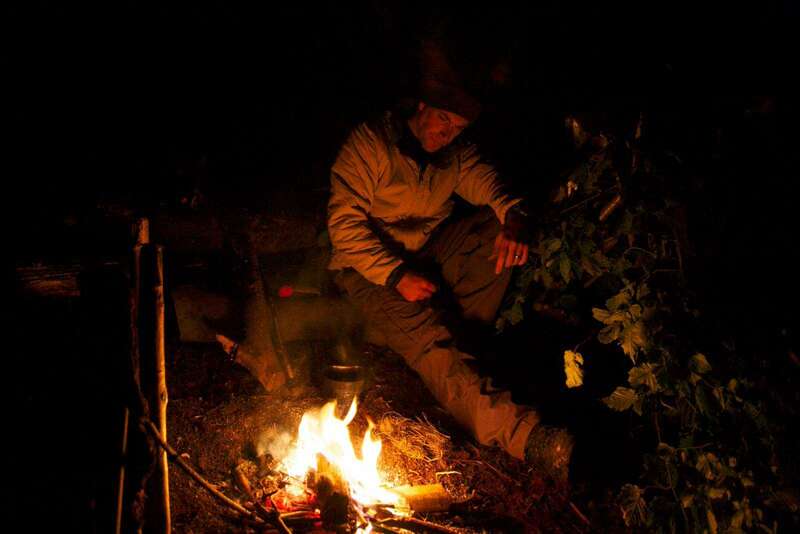 As we like to say here at Wildway Bushcraft, it’s about more than ‘just survival’. 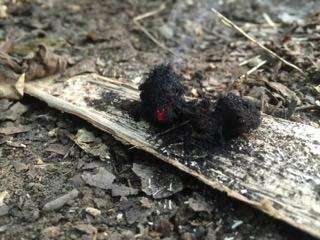 Read on to learn more about the origins of friction fire-lighting, what you can learn on our weekend bushcraft course, how to perfect your technique, and how we can help you. Friction fire-lighting is a skill that has been around as long as humans. There is even evidence of fire being used by Homo Erectus around one million years ago. The fact that our ancestors were able to light fires and, importantly, replicate this technique whenever they were called upon to do so, ensured the survival of our species. There is a range of academic theories that believe fire lighting began with exploiting natural fires, such as lightning strikes. This then evolved into our ability to transport embers, then, eventually master the art of friction fire lighting. 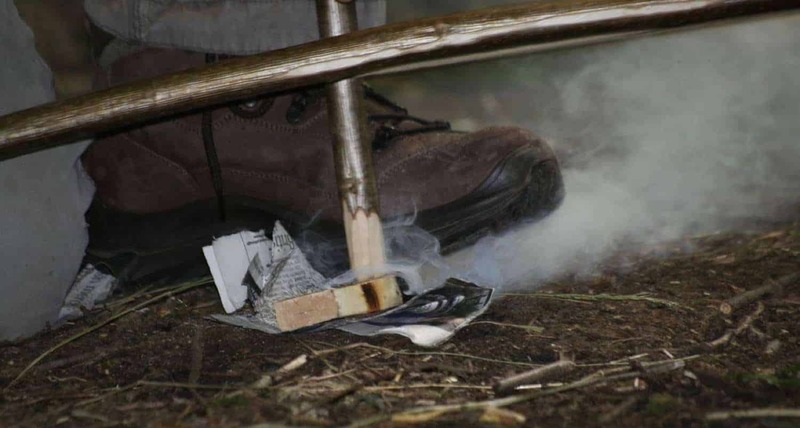 Our weekend bushcraft course, held in beautiful woodland on the Dorset/Hampshire border, introduces you to the basics of friction fire-lighting. If you already have a degree of knowledge around friction fire-lighting, then our instructors are willing to work with you to help you to develop your skills further. 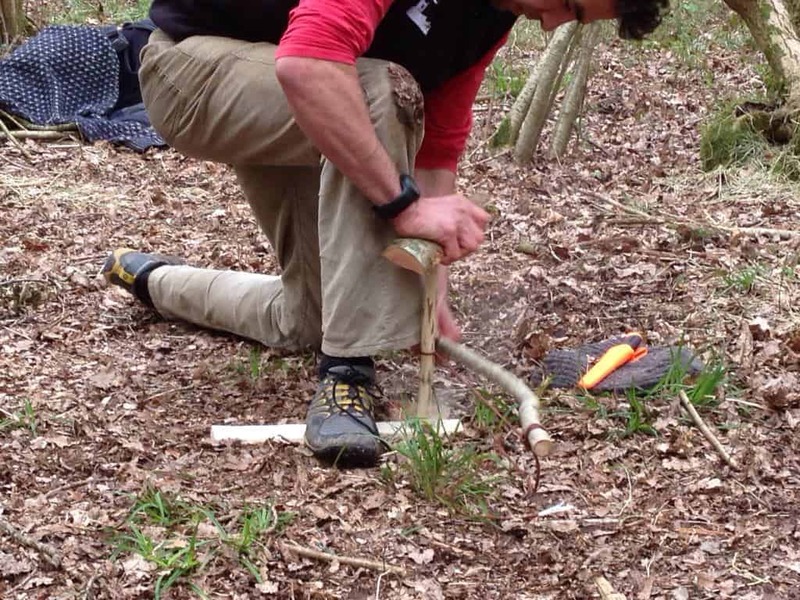 On our Weekend Bushcraft Course, we will introduce you to the basics of bow-drill techniques. Having shown you how to use a knife in a way that enables you to make the cuts needed to construct a bow-drill. From there, we will show you how you can use your bow-drill to hopefully get an ember. If you’ve never heard of a bow-drill before, have a look at our blog on perfecting your bow drill technique. Our courses are very flexible. As we’ve said, if you have a basic level of understanding, then we are willing to work with you to help you to get the most out of our sessions. If you would like a specialist fire lighting session then book on to our one day friction fire lighting course. Have a go at making your own bow drill and practice your technique at home. Upload photos to our Facebook group here and let us know how well you are getting on with your bow drill. We will try our best to help you from a distance! 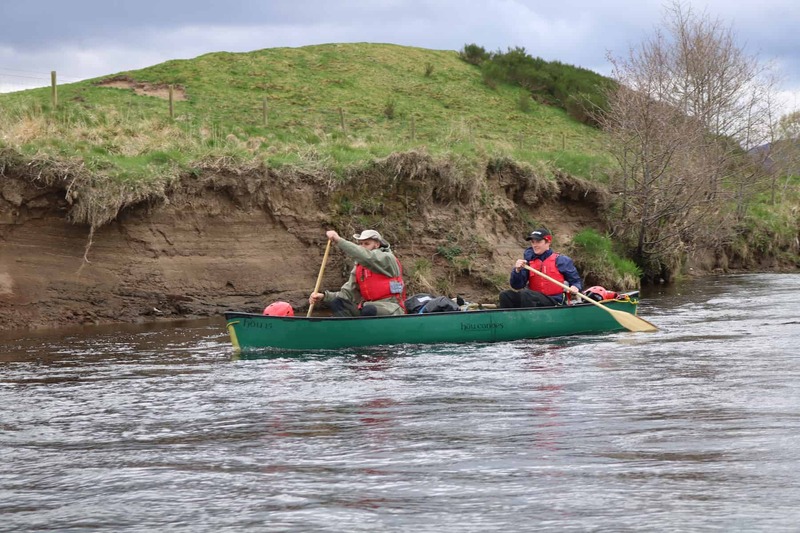 On the 8th -14th of July 2019 we will be running a truly once-in-a-lifetime trip, canoeing along the river Spey. This incredible trip will begin on Loch Insh and continue all the way down, through the beautiful Scottish countryside until we reach Spey Bay. Read on to learn more about this amazing trip and how you can sign up for more information. 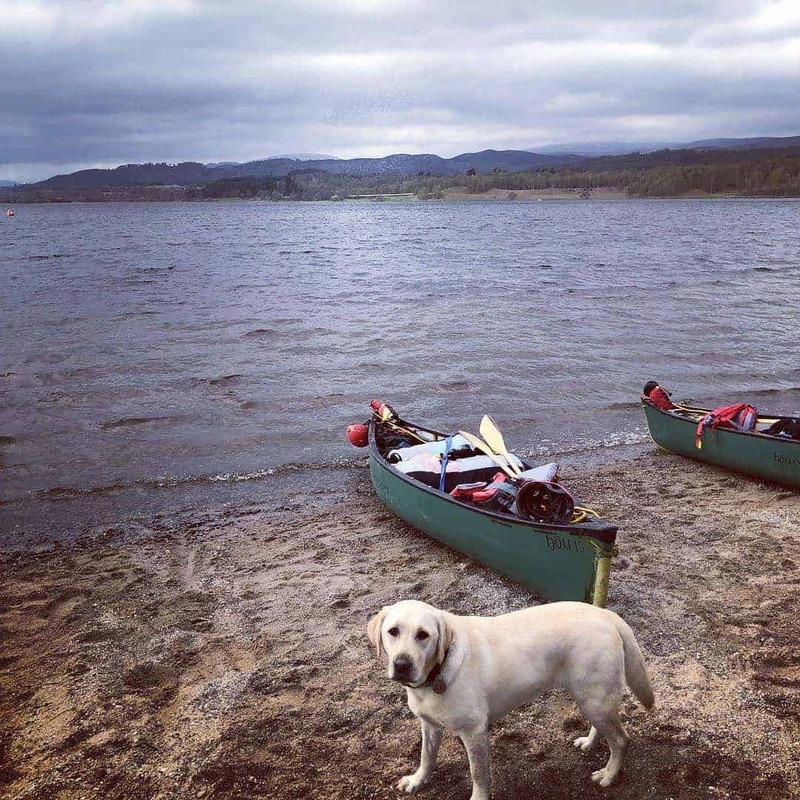 Our river Spey canoe expedition starts at the beautiful Loch Insh in the Highlands region of Scotland. Situated seven miles south of Aviemore, in the heart of Badenoch and Strathspey. From there, we wind our way down the river Spey, camping under the stars along the river each night, until we reach Spey Bay. 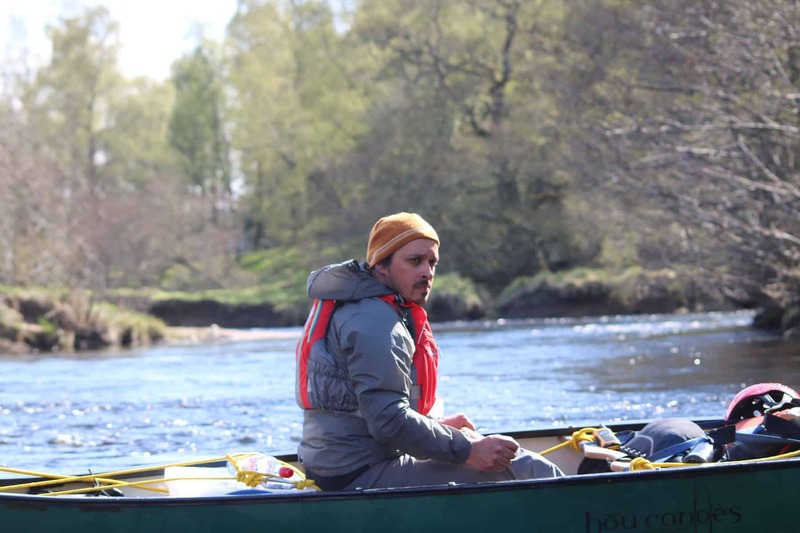 As we canoe down the river Spey you will have a chance to pick up some bushcraft skills as we camp each evening. Alternatively, you can just relax and revel in the beautiful surrounding scenery. Watch the video below for a glimpse of what to expect on your river Spey trip. The river Spey is the ninth longest river in the UK and one of the fastest flowing in Scotland. Famous for its salmon fishing and use in whisky production, the Spey flows for 107 miles (172 km) from Loch Spey to Spey Bay. While you don’t need to be an expert paddler to join our river Spey trip we do ask that you have a reasonable level of fitness and are able to swim. All under 18s do need to be accompanied by an adult. 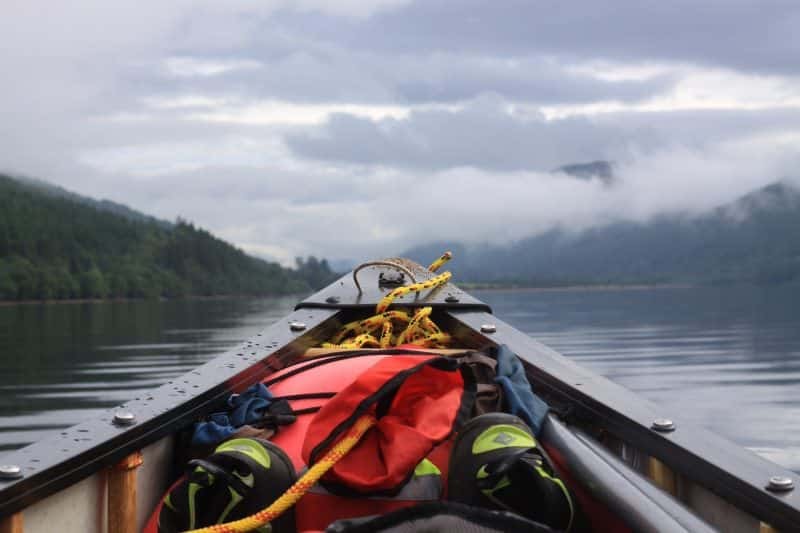 You will have a chance to get up to speed and practice paddling on the loch before our adventure begins. While some previous canoeing experience would be of value it is not absolutely necessary. Throughout the trip, our expert and highly trained course leaders will be on hand to provide you with canoe tuition, no matter what your level of skill. The beautiful river Spey is home to a wide variety of fantastic wildlife. While we can’t guarantee that you will see everything that there is to see – after all, nature is unpredictable – hopefully you will spot something. In the summer Bottlenose Dolphins are regularly spotted in Spey bay; Atlantic Salmon swim throughout the length of the river, otters and seals dart from its banks and Ospreys soar overhead. Find out more information about the fantastic range of wildlife on the river Spey in our blog here. Throughout the trip, all safety and technical equipment will be provided by Wildway Bushcraft. If, however, you have your own buoyancy aid please do bring it with you. In addition to all the technical and safety equipment, we will also provide you with dry bags, these will help to keep your stuff dry throughout our trip. Each night of the trip we will wild camp alongside the beautiful river. As such, you will need to bring your own camping equipment. We do have a comprehensive kit list which can be found here. If you have any questions about the kit required for this trip then don’t hesitate to email us on john@wildwaybushcraft.co.uk . If you would like to know more about our river Spey trip then fill in the form below. We won’t spam you, we hate it when companies do that, but we will keep you updated about this trip and send you relevant information.